Pietro Montanini initially trained under his uncle, Giovanni Francesco Bassotti. He moved to Rome in 1644, where he worked under Pietro da Cortona and Salvator Rosa. He returned to his native Perugia in ca. 1658. He belonged to the Confraternita di San Sebastiano e Rocco in Perugia, and was its Guardian in 1661-2. His students included Giuseppe Laudati and Mattia Batini. These frescoes on the walls of SS Sebastiano e Rocco, which are dated by an inscription under a miracle of St Roch, were recorded in 1736 as the work of Pietro Montanini. The attribution is supported on stylistic grounds and by the fact that he belonged to the confraternity that owned this church. These frescoes on the arch leading to the chapel on the right in SS Sebastiano e Rocco, which are attributed to Pietro Montanini, depict the standing saints as hermits. This panel, which is dated by inscription, depicts the standing hermit saint surrounded by 14 scenes from his life. It came from an altar in Sant’ Elisabetta that belonged to the Collegio dei Tintori (dyers’ guild), whose patron saint was St Onuphrius. It is now in the sacristy of SS Sebastiano e Rocco. It is attributed to Pietro Montanini on stylistic grounds, not least because of its similarity to a painting of this saint by Montanini in SS Sebastiano e Rocco (see above). The altarpiece of the Oratorio dei SS Simone e Fiorenzo was documented in the 18th century, with an attribution to Pietro Montanini and the date of 1674. It depicts the Madonna and Child with SS Jerome, Catherine of Alexandria and Simon Stock. According to the guide to Perugia written by Serafino Siepi in 1822, these panels in the apse of San Filippo Neri were commissioned from Pietro Montanini to mark the 50th anniversary of the unification of the parishes of San Giovanni Rotunda and San Gregorio with that of San Filippo Neri. This panel, which is attributed to Pietro Montanini, came from the Collezione Sapori and is now in the Galleria Nazionale. It depicts Christ and St John the Baptist as young boys, with a group of angels, set in a landscape. This panel in the Collection of the Fondazione Cassa di Risparmio di Perugia, which is otherwise of unknown provenance, is attributed to Pietro Montanini. Pietro Montani, who is absent from the documentary records of Perugia from late 1674 until 1676, seems to have spent this time in Città di Castello. ✴the Annunciation to the Shepherds. 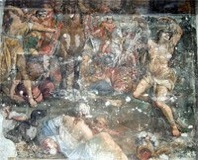 Girolama Bandini, the wife of Chiappino Vitelli commissioned this fresco (now badly damaged) for the vault of the Cappella dell’ Angelo Custode. The brothers Nicolò and Annibale Longini commissioned these frescoes for the vaults of the the Cappella di San Paolo. They depict Christ in Glory, flanked by two scenes from the life of St Paul. This panel in the crossing, which came from Santa Caterina, is attributed to Pietro Montanini. ✴ the Risen Christ and St Mary Magdalene (noli me tangere). Return to Art in: Assisi Città di Castello Foligno Perugia.